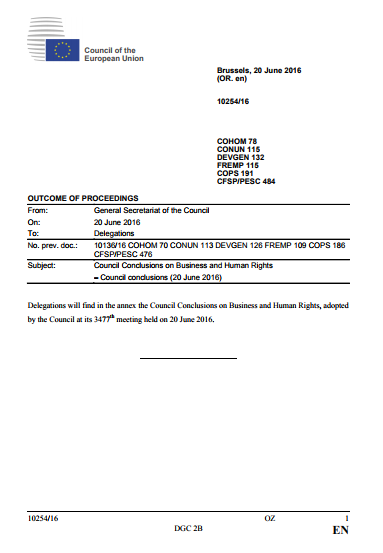 string(1097) "Resource Centre > Uncategorized > Council Conclusions on Business and Human Rights"
The Council strongly supports the UN Guiding Principles. Their implementation supports and promotes human rights, thus reducing risks for people and business. The Council also supports the OECD Guidelines for Multinational Enterprises and the ILO Tripartite Declaration on Multinational Enterprises and Social Policy, and acknowledges the importance of the UN Global Compact and ISO 26000 Guidance on Social Responsibility.